Posted byAndrew Germishuys	 2013/05/15 2013/05/15 Leave a comment on Something To Scream About! With the highly anticipated release of Monster’s University, which enrols for release on Friday 21 June nationwide, Disney/Pixar has collected the biggest, bravest, most incredible and tyre-screeching-ly awesome titles to ever have appeared on shelves together in The Monster Disney/Pixar Festival! From 11 June to 31 July, a vast range of DVD, Blu-Ray, gaming, toys and consumer products will be available in stores nationwide at extra special prices. What better way to prepare for Monster’s University, than to go back to where it all started…in stunning 3D? Available for the first time on eye-popping 3D, Monster’s Inc will be available from 11 June. Journey into Monstropolis and meet the city’s top scarer James P. Sullivan, better known as Sulley, and his wisecracking best friend Mike Wazowski as they scramble to prevent catastrophe when a human enters their world. That’s just the tip of the iceberg though. 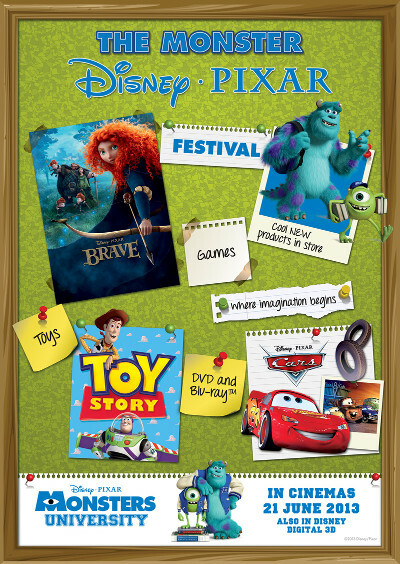 Together with Monster’s Inc, fans will be able to add a plethora of DVD and Blu-Ray titles to their collection. From the Academy Award-winners Finding Nemo, The Incredibles, Ratatouille, Wall-E, Up, Toy Story 3 and Brave to fan favourites like Cars, Toy Story and A Bugs Life, as well as the famous Pixar Shorts Vol 1 & 2, there is no better time to complete your collection from the world’s number 1 animation studio! promotion, across all platforms. From the heart-thumping The Incredibles, Toy Story Mania 3D, Brave: The Video Game, to the educational Disney Learning: Finding Nemo and the comedic romps of Cars Toon: Mater’s Tall Tales – the holidays will never be boring. Just Fun Toys and Prima Toys are both joining in the Monster’s and Disney/Pixar craze as they release an exclusive and exciting range of toys. Have monster-ous fun with the Monster’s University Roll and Scare figurines and playset filled with frightful surprises. Be the next scary monster with Sulley Scare Mask… your scare will raise some brows! Interactive plushes are the name of the game as My Scare Pal Sulley and My Scare Pal Mike hit shelves, complete with triggers that activate surprise phrases and sounds that will have kids in giggles. The cold weather will be kept at bay as youngsters set their imagination free. every kid can be cool like their favourite monster! 11 June through to the end of July.